KIEV, Ukraine -- Ukraine's president has played down plans by some European leaders to boycott Euro 2012 matches in Ukraine over the imprisonment of ex-premier Yulia Tymoshenko, saying the event will be a success, according to an interview published Thursday. 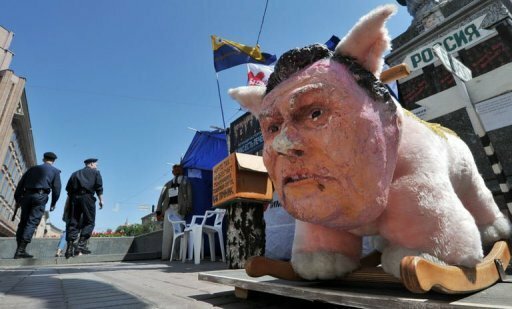 Policemen walk past a toy mocking Ukraine's President Viktor Yanukovych as they guard a camp of Yulia Tymoshenko supporters in central Kiev. "Why do you think nobody is coming?" Viktor Yanukovych was quoted as saying. "All the tickets have been sold, the excitement is incredible... Euro 2012 will take place and there will be fans!" Yanukovych also suggested in the interview with the Segodnya daily newspaper that Tymoshenko, who is suffering from a severe spinal condition, will not be allowed to be treated abroad despite an offer to treat her in Germany. Tymoshenko, 51, is serving a seven-year term on charges of abuse of office, a case condemned as politically motivated by the West. Allegations she was beaten by prison officials in April have prompted top EU officials to announce a boycott of the football (soccer) championship games hosted in Ukraine during the June 8 - July 1 event. Brussels stepped up pressure on Kiev on Thursday, as the European Parliament adopted a resolution calling for the "unconditional immediate release of all prisoners sentenced on politically motivated grounds, including leaders of the opposition." Ukraine's Deputy Prime Minister Valery Khoroshkovsky said the government would take the resolution into consideration, the Interfax news agency reported. Yanukovych said he was in favor of letting Tymoshenko be treated abroad, but claimed that he had no chance of pushing the necessary legislation through Parliament, despite the fact that pro-government parties hold the majority of votes in the Ukrainian legislature. On Wednesday, lawmakers loyal to Yanukovych shot down a motion to consider a bill that would allow Tymoshenko to undergo treatment in a foreign country. "I am often advised, 'Why don't you send Tymoshenko abroad to get treated?'" Yanukovych said. "If this depended on me, I would have done it long ago. But this is not allowed by the law, there needs to be appropriate legislative changes" for this. Tymoshenko is suffering from intense pain and partial paralysis caused by a herniated spinal disk. After months of Western pressure, she was moved last month to a local clinic in the eastern city of Kharkiv, where her prison is located. Tymoshenko is being treated there under the supervision of German doctors, because she says she doesn't trust Ukrainian health authorities. The top opposition leader is also recovering from a nearly three-week long hunger strike launched to protest the alleged beating. Photographs of bruises on her stomach and arm caused international outrage, and led to a number of EU officials and governments refusing to attend games played in Ukraine. One of the German doctors treating her, Dr. Anett Reisshauer from Germany's Charite clinic said Tymoshenko's health was improving, but she was still seriously ill.
"There is progress, the patient is already eating normally, but other than that it is still a serious illness," Dr. Reisshauer was quoted as saying by the Interfax news agency. Tymoshenko was sentenced in October for abusing her office powers while negotiating natural gas imports with Russia in 2009. She denies the charges and says that Yanukovych, who narrowly defeated her in the 2010 presidential vote, put her in jail to bar her from the fall parliamentary election.